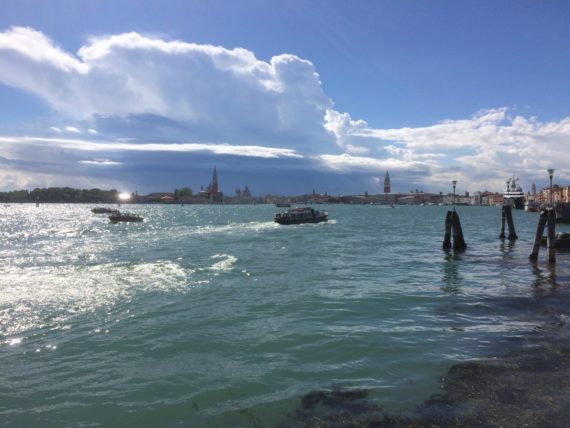 I arrived in Venice and my first destination by water boat, is the Giardini. Upon my arrival I take a moment to stand and look over the river, placing my hands on the stone wall running by the Giardini Gardens. 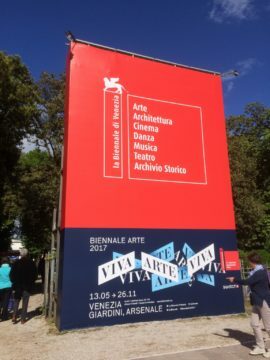 I turn 360 degrees and I am faced with a 50ft advertising board for the Venice Biennale. This juxtaposition seems like an interesting point for considering the relation of the festival in this ancient city. The ad comprised of vinyl graphic (which I see regularly around London, most commonly on building ad wraps) on a metal temporary structure. I consider this a temporality, which seems to add an element of precariousness. Before I have even seen the festival, I initially ponder what sort of impact does a festival of this scale, have on not just the cities infrastructure, architecture, but also the locals that live here, whether it be positive or negative? Art in precarious times: A discussion of the implications of the global rightward shift on creative practices. 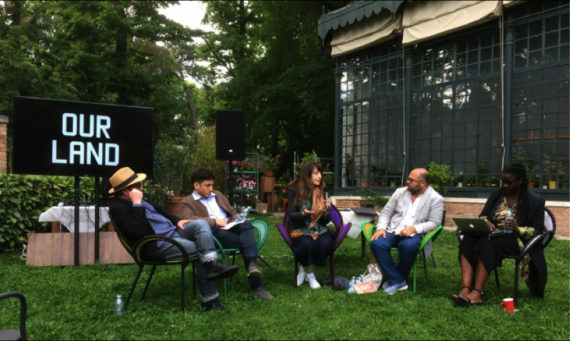 In the gardens of Serra Dei Giardini is a local cultural organization, “Micro Clima”, which hosted Creative Time (an organization who present art in the public realm) for an evening of conversation. The event featured Creative Time’s, Nato Thompson and Elvira Dyangani Ose. Other participants in the panel, included Paolo Rosso of Microclima, artist Hassan Khan, and Hands Off Our Revolution founder Ann Marie Peña. The panel reflected on the current political situation and the implications of the global shift to the right, for creative practices and collective futures. 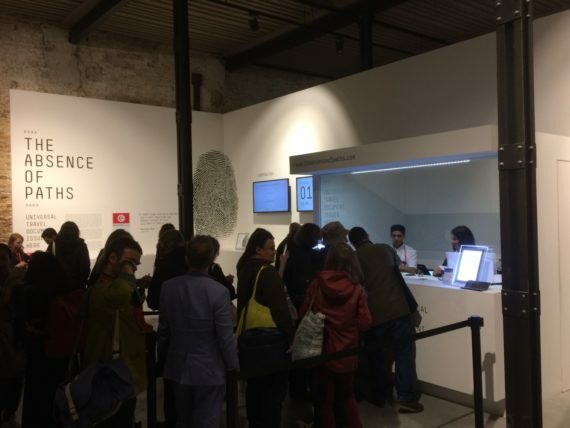 This initial dialogue felt like a presupposition that I could not shake throughout my time at the festival, which was probably intentional, as it was the first event I saw prior, to the rest of the Biennale. Nato began by stating ‘Precarity can be an organizing principle’ which led him to consider, that anger can be a condition of change. Nato gave a brief yet concise outline of numerous social movements, that have come to exist over the last 20 years, predominantly from the United States of America, such as Occupy Wall Street, Occupy Museums, Black Lives Matter, Woman’s March to Climate March, only to name a few. 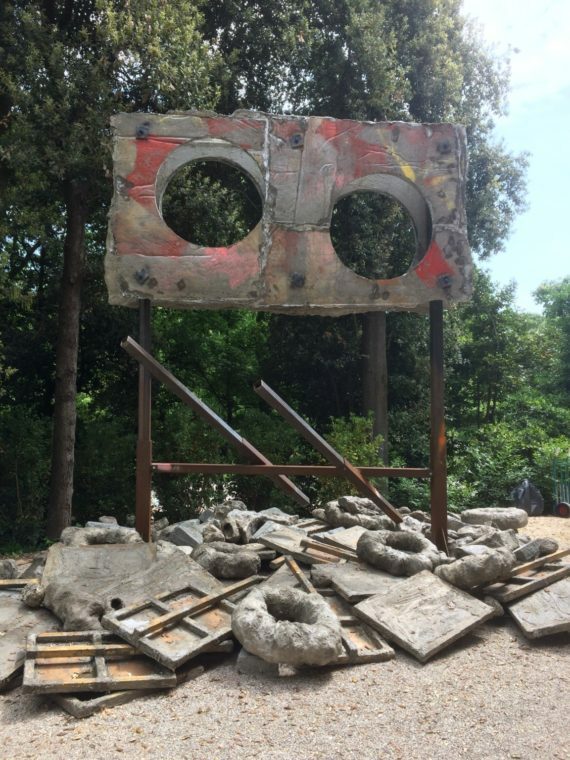 There was a clear institutional critique being explored, yet being at the Venice Biennial, felt like a clear reminder of the complicity of art in capitalism, which Nato acknowledged and was right too. Hassan for me, frustratingly commenced his section with “all times are precarious” which initially felt neutral, by not addressing what is happening now. He began to consider what are these fascist impulses that people are feeling? And rather than simply defy as a default setting, he considered the direction of trying to understand them, why are they arising now? What is causing such a shift? To understand the outcome of something you must first understand what caused it. At points there was the suggestions that art’s aim is not to solve things, which is then interesting to consider what is the potential role of art in 2017. As Nato had reminded us of the situations in the USA, Ann Marie Pena created a very strong reminder of the political state of the UK, by discussing the murder of Jo Cox which she feels “did very little to change the xenophobic discourse”, which unfortunately simply continued after Cox’s death. Paolo Rosso outlined the impact the Biennale has, on the city of Venice, from a local perspective, such as financial implications. Rosso explained that local government rarely allocate much funding for local artists or spaces, because there is so much international money that passes through the city during the biennial. This has forced local art spaces to close or be taken over, yet this anger from artists, has now created more artist run spaces, and innovative works; cause and affect, I guess. Each individual had tackled the term of precarious in different ways, and I am personally under the pretence that all artworks are political in some nature, it cannot be avoided. If the work was made in 2017, it will be read in a wider context of issues of the time, which is unavoidable. Therefore, discussing these wider global issues, are integral but when does art become frivolous or rhetoric, in comparison to taking direct action, such as the social movements Nato discussed. I think this is where art can reveal offer transparency and possibly act as a tool, that can be considered in a wider perspective, rather than solve. Considering Barlow’s work, it is not hard to imagine the word precarious being used to describe it, as you are confronted with towering sculptures that appear to be on the edge of collapse, suspension or leaning. Barlow has continued to develop her language of sculpture, and Folly seems to host every Barlow process and material, at its most ambitious. The title Folly she describes as something foolhardy, risky or stupid as well as having a reference to a building, constructed primarily for decoration, something like a pavilion. Barlow describes elements of her exhibition as ridiculous, humorous and comical, while also being celebratory and I think it’s this in-between state is where Barlow likes her audience. Attempts of freedom and the collapse of it, seems to chime, with not just her work but the wider political issues that say Art in precarious times discussed. I found Barlow’s speech for the opening of the pavilion refreshing, it was without saying extremely humble and gratuitous, but it was when she began to reflect on the political situation of the UK, that this extremely poignant subject brought a slight emotional tone to her voice. Without directly saying the word Brexit, she gestured her concerns with the closing of borders and what impact this will have on human migration, creativity and artists. She reflected on the joy during the install period at the pavilion and meeting her fellow biennial artists, who are of course from all over the world. The British pavilion being neighboured by France, Canada, Germany, Japan and Republic of Korea. She mentioned that each artist would stop to converse about his or her installs and to touch base with how each other were getting on. She found this context a reminder that not just countries but also individuals can co-exit and support each other, whether it be a passing hello or a suggestion of an issue discussed. Barlow concluded that these delicate and small moments reinvigorated a sense of optimism, not just in the world but also her artistic practice. These moments may feel fleeting and slightly precarious, but also induce certain hopefulness. Even though Barlow’s installation spilled out of the pavilion there seemed a balance between the work, not dominating over the space rather exposing every nook and cranny of the building, thus high lighting its grandness. Laboratory of Dilemmas in the Greece Pavilion by George Drivas, uses the tactic of darkness and a labyrinth like installation, to draw the entire focus onto the work, no distraction here. This installation is so multi-faceted, it took me three visits to truly appreciate it, though the impressiveness would be, that it allured me back so many times. Laboratory of Dilemmas is a narrative video installation – based on Aeschylus’ theatre play Iketides (Suppliant Women), which poses a dilemma between saving the Foreigner and maintaining the safety of the Native. Aeschylus’ Iketides (Suppliant Women, 464-463 b.c) is the first literary text in history that raises the issue of a persecuted group of people seeking for asylum. The story is presented in fragments, through multiple video and sound sources inside a Labyrinth. On the upper level, you are met with 6 screens with discovered footage along the bannisters. 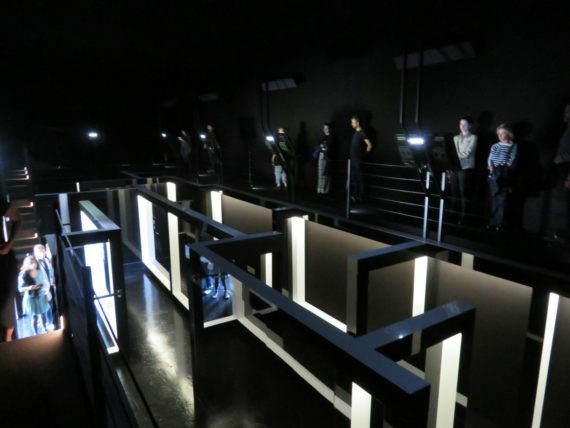 While upon the upper level you are able to look down at fellow audience members, navigating their way round a maze-like space. This instilled thought of Tolman and Honzik (1930) famous experiment, where they built a maze to investigate latent learning in rats. In this case are we, the public, the rats in Drivas work/experiment? By the time one has made their way round The Upper Level and The Lower Level/Labyrinth, you begin to unpick the dilemma that is being communicated more clearly. The comparison of this exhibition and what is happening in wider society, begins to play out, with the primary question being, should the scientist prevent these two cells from interacting? On the one side it could benefit the existing cell/culture or on the other it could damage it. The discourse around this issue plays out more directly in the screening room, a film that portrays scientists and official representatives, discussing such matters. There is no conclusion made and the dilemma remains open and that is the point. In this exhibition, it would be very easy to change the word cell, with migrant, and you have a discussion that is globally pressing. The topic of migration and borders has been at the fore in the UK media and politics since the commencement of the EU Referendum. What have I learnt as a person and what have we learnt as a country? With migrants still fleeing on boats, most recently seen off the coast of Spain on 30th May 2017, and the Calais Refugee Camp, still a very real situation, are just a few reminders on my doorstep. The much wider global issue of migrants fleeing war torn countries, is a situation so hard to fathom, that videos and images from these places, seems difficult to comprehend. Laboratory of Dilemmas deals with a global socio-political issue, albeit in slightly complex and at times convoluted way, it certainly provokes thought. Though going back to Creative Times talk Art in Precarious Times, where Nato Thompson considers art as a tool to reveal, The Tunisian Pavilion merges this tool simultaneously with live action. 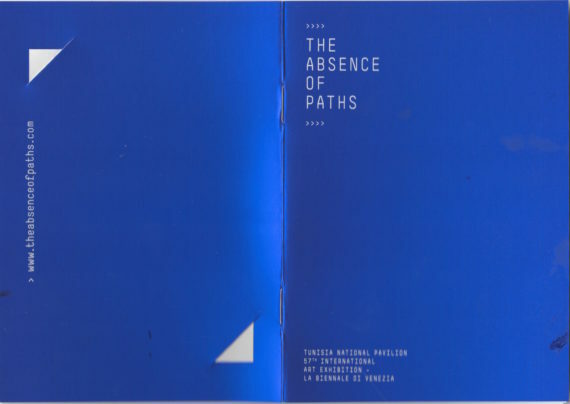 The Tunisian Pavilion presents The Absence of Paths. It was in the Arsenale where I encountered my first kiosk. 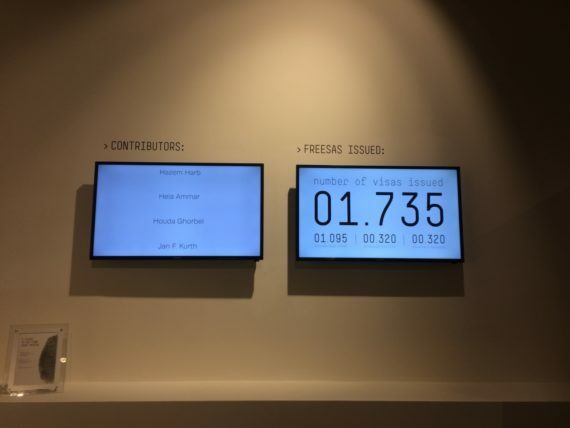 Beside the kiosk sits two live monitors, presenting the increasing numbers of freesas being issued and names of contributors. The freesa signifies a document that represents an idyllic world, where “human beings may flow freely from one nation to the next”. The application form to claim your freesa at the kiosk, is very simple and upon passing over your fingerprint, you are given a blue travel document. As the kiosk attendee passed the document to me, she said “ You are officially part of the world, what you do with this document is your own decision”. When holding the freesa its accuracy to a real travel document, such as my British passport seemed uncanny and that is because these documents have been made, by a company that produces official travel documents, for many European countries therefore using the same paper, same ink, same font etc. 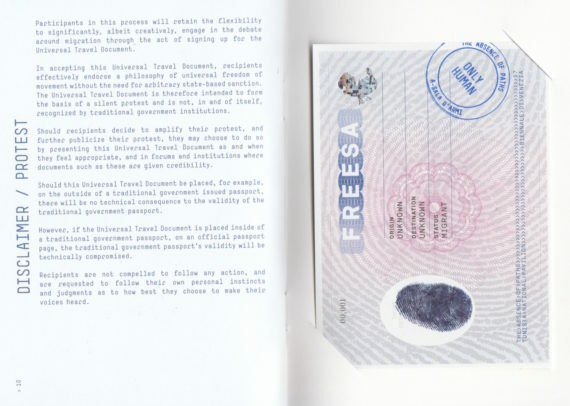 The curator of the Tunisian pavilion Lina Lazaar, states the aim of freesas project, was to “highlight the absurdity of a global system where we are defined by the legal documents we have or don’t have”. Though I feel this piece does more than that. This project has migration and the re-evaluation of our collective humanity at its heart and while doing so offering a symbol of utopia. With the rise of the right being met, with some resistance in Europe, whether it be Le Penn or Welders not being elected. The discourse around open or closed borders, will continue to evolve with Trump and Brexit still at play. In October 2016 Morgan Quiantance released the article, Rules of Engagement via Art Monthly where he considered ‘why there is not more politically engaged art in these turbulent times’. Though the text referenced predominantly the UK with the credit crunch, austerity and Brexit Britain, I feel similar notions could be said globally. 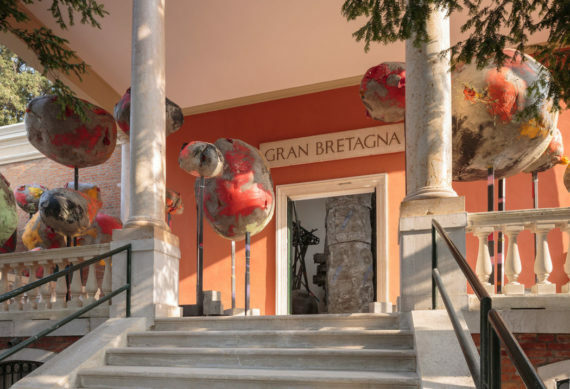 What might be the rules for future political engagement in art, especially in relation to the global reach of a festival like the Venice Biennale? Does it have a responsibility to do so and if so in what form? The three works I have explored, could be considered a success in their political and social rigour. I can’t help but think of the long term, what will the legacy be of say The Absence of Paths? Will it solely be an Instagram account online? How many people will do anything with their Blue Freesa, or will it end up on a shelf at home, which may inevitably one day end up in the bin. I do not intend to be intentionally pessimistic as I do hope these projects will provoke enough meaning that it may change someone’s outlook on the world or re consider there own actions. The beauty is we will never know, but if a work of art changes one person’s life or their direction perhaps that’s enough.